Land was sighted in June 1497 after just over a month of travel, and John Cabot is credited with the second discovery of North America, and Newfoundland which celebrates the event as Discovery Day. Among the most infamous battles of the First World War and the most emblematic of its horrific slaughter, the Battle of the Somme began on July 1, 1916. The attack was launched along a 30-kilometre front in northern France. Initially planned by the Allies as a French-British assault, it was intended to divert German forces from their ongoing siege at Verdun. The expectation was that an eight-day preliminary artillery bombardment would destroy the German wire and the forward German lines, allowing advancing forces to simply walk in and take possession of the territory. The artillery, however, failed to destroy either of these targets and at 7:30 a.m. on July 1, 1916, when the bombardment lifted, German infantry emerged from their bunkers to aim their machine guns at the gaps in the otherwise intact wire. An estimated 60,000 British and Allied troops, including close to 800 Newfoundlanders, were killed or wounded on that one day alone. The Battle of the Somme lasted until November 18, 1916. Only 12 kilometres of ground were gained, with 420,000 British, 200,000 French, and 500,000 German casualties. Looking for your Newfoundland Ancestors Who Served in the First World War? Newfoundland was a Dominion of the British Empire when the First World War broke out. At the time, there was no formal military presence in Newfoundland, but the Government of Newfoundland went on a recruiting drive to provide a force for British service. Many Newfoundlanders also joined the war effort by joining the Canadian Expeditionary Force (CEF) in Canada. After Newfoundland joined confederation in 1949, the personnel records for the Royal Newfoundland Regiment and the Newfoundland Forestry Corps were transferred to the Government of Canada as these individuals became eligible for veterans’ benefits. Later, the files were microfilmed by Library and Archives Canada (LAC) and FamilySearch. The originals remain in LAC’s holdings. If you aren’t sure in which service your ancestor served or where he joined, you will need to look at both the CEF records using the Canadian soldiers of the First World War: 1914-1918 database for people from Newfoundland who enlisted in other parts of Canada and the general Archives Search for people who enlisted in Newfoundland regiments. For the latter group, enter the surname of the person, “Newfoundland” and RG38 in the keyword search. The results page will identify which microfilm reel you will need to order to consult the service record. Meanwhile, the microfilms can be consulted onsite at LAC, through the Family History Centre or in the Newfoundland Provincial Archives at The Rooms in St. John’s. The latter has digitized some of the service files and these can be found in the Newfoundland Regiment and the Great War database. LAC is presently digitizing all of the remaining 640,000 service files of the men and women who served in the First World War with the Canadian Expeditionary Force. The digitized service records will be made available on the website as they become available, but access restrictions may be in effect at times. Learn more about the digitization of the Canadian Expeditionary Forces Service Files by consulting the Fact Sheet: Digitization of Canadian Expeditionary Force Service Files. 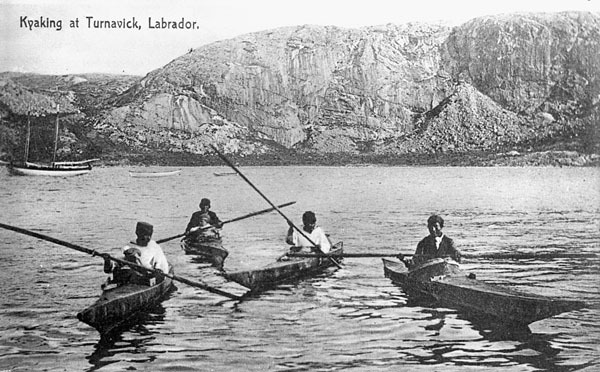 Did you know that thanks to the collection of Library and Archives Canada (LAC) it is possible to patrol the French Shore of the island of Newfoundland with Lieutenant Louis Koenig and discover this particular area where the French had cod fishing rights for almost 200 years, because of two treaties signed between France and England? Accompany Koenig and the crew of the French frigate La Clorinde during a campaign that brought them to Newfoundland, Cape Breton Island and Saint-Pierre and Miquelon in 1885. Recognized by the French Navy for his artistic talents, Koenig created the 145 drawings and watercolours, the hand-drawn maps and the logbook, which are found in the Louis Koenig fonds and Louis Koenig Collection. 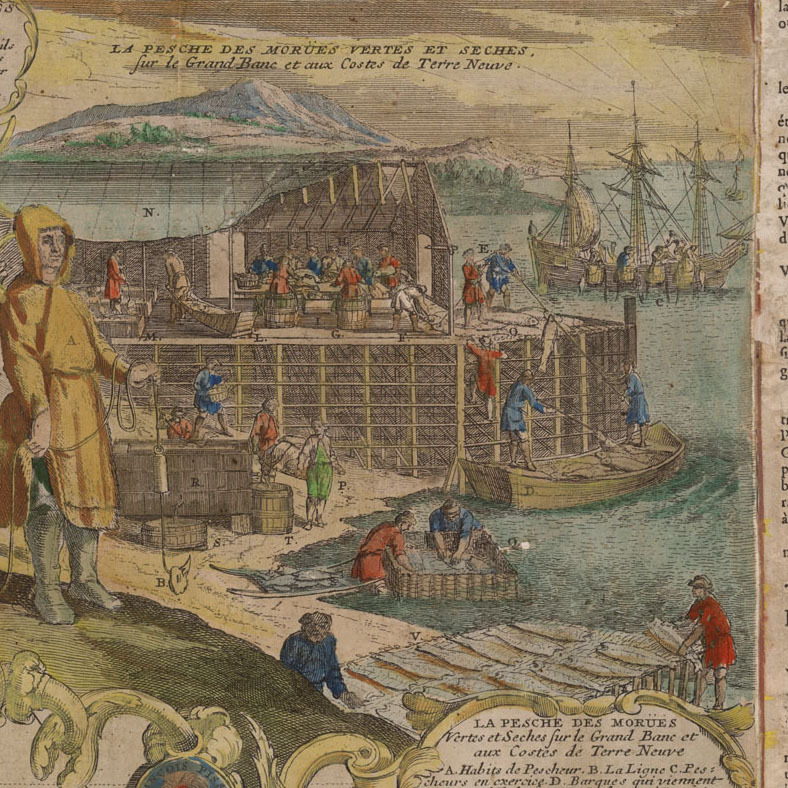 The illustrations, most of which were done on site, show the landscapes and military installations he observed, as well as daily activities on board La Clorinde. 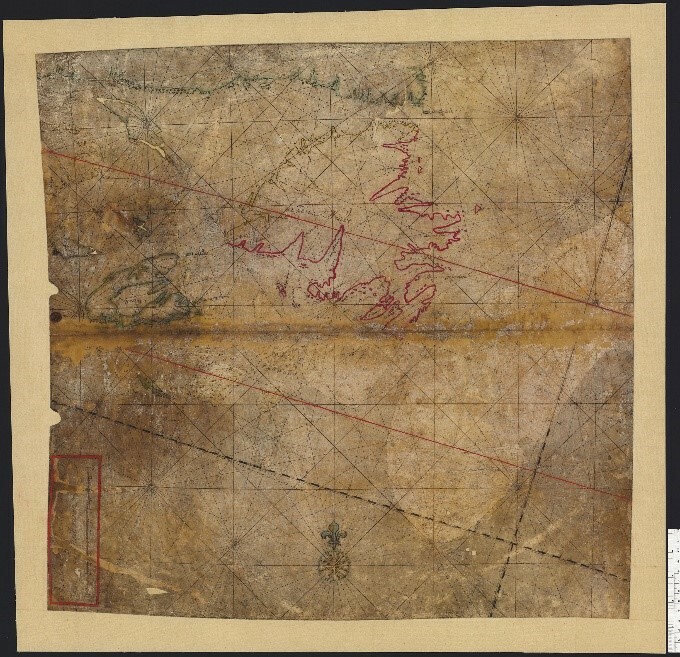 The maps give three views of the French Shore and include notes by the artist.The logbook, also written by Koenig, documents the voyage, the places visited and gives his candid impressions of his experiences; devoting particular attention to the mosquitoes, which were apparently delighted to welcome the French sailors! 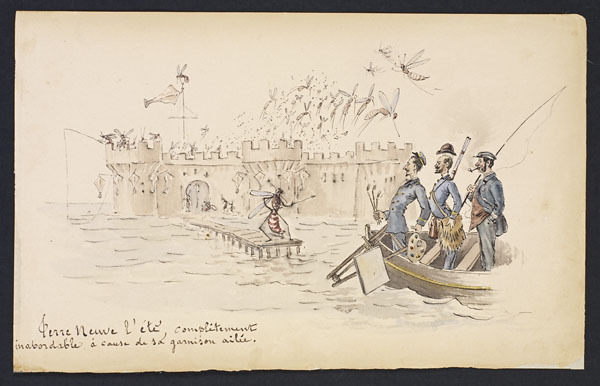 The collection also includes a small sketchbook containing an illustrated, much more personal, account of the voyage, full of humour and whimsy presented by Koenig as a gift to La Clorinde’s commander, Félix-Auguste Le Clerc. Koenig also wrote an article Le « French Shore » (souvenirs de campagne à Terre-Neuve) (The “French Shore”, Memoirs of a Newfoundland Campaign), embellished with his maps and illustrations and published in 1890 in the periodical Tour du monde. To order published documents that are unavailable online, use our online Request for Retrieval of Documents, or call 613-996-5115, or toll-free 1-866-578-7777, to consult them in person at 395 Wellington Street in Ottawa. Enjoy the discoveries and view the Flickr set of images from Koenig’s albums!